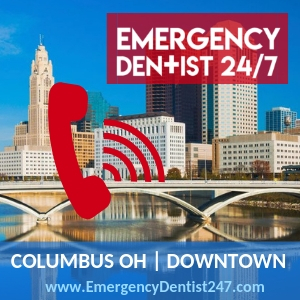 We have a 24-hour, 7 days a week Columbus emergency dentist referral network. Give us a call at 1 (614) 350-6266 and tell us the details of your emergency, we’ll call you back with a booked appointment that will allow you to receive care within 24 hours. Once your appointment is booked, there are a number of things you’ll need for your important. Have your driver’s license or some form of acceptable personal identification to bring with you. You’ll need to have any recent paperwork from the last year from your regular dentist as well. This can be anything from dental x-rays or a detailed receipt with the outline of treatments you’ve received. Anything you can find will help the emergency dentist and their staff understand your dental health better. If you’re currently taking any medications or have any allergies to medications, let the emergency dentist know. They need this information to make sure nothing is given that could cause a reaction at any point during your treatment. If you have dental insurance, call ahead to make sure its accepted by the emergency dentist. If you don’t have insurance, you can still call and receive a quote for the cost of your visit. Be sure to show up 15 minutes prior to your appointment. This allows for spare time to fill out paperwork, ask questions, and make known any other concerns you may have. If you’re having any anxiety centered around your visit, let the staff know so they can make you calm and comfortable during your appointment. If your dentures need repaired or replaced, our emergency referral network can help you book an appointment. 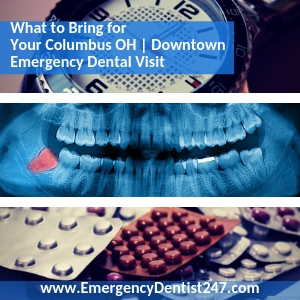 Emergency denture repair is easily accessible to patients in Columbus, Ohio. You can have your current set of dentures repaired or a new pair fitted in the same appointment. Dental emergencies are not easy. They can bring quite a bit of pain and discomfort to you. However, knowing about some of the most common dental emergencies can help get you through yours. As mentioned before, they come at inconvenient times that don’t really adhere to your schedule. 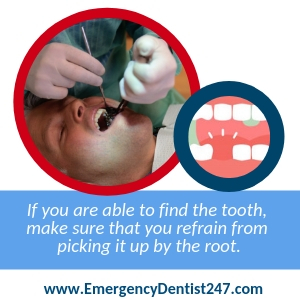 One common dental emergency is a lost permanent tooth. Once you’ve established that you haven’t endured any head trauma it’s time to head to the dentist. Your first priority is going to be locating your lost tooth. Pick it up by the part that is visible to your mouth, the crown. You can damage it if you pick it up by the root. And damage to the root can ruin your chances of having it implanted back into the empty socket. You can preserve your lost tooth a couple of ways. You can try to put it back into the socket temporarily or putting it in a cup of milk or water until your appointment. These emergencies can be some of the worse. Not only are they painful, but they can be dangerous if gone untreated. It’s important you seek treatment as soon as possible. If you’ve had a chip that’s close to your gum line, you are at risk for developing an abscessed tooth. Check if your mouth gets swollen or has red bumps similar to acne. If you think you may have an abscessed tooth, get to a dentist as soon as possible. You don’t want to risk prolonging the infection as it will only become more serious. 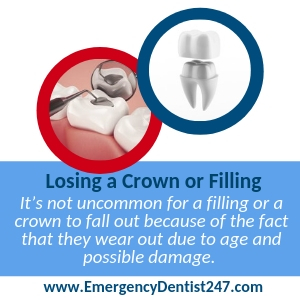 Having a crown or filling fall out is a possibility especially if they’ve aged or have ever been damaged. If you’ve lost either of these, find some dental cement, gauze, or cotton balls and keep the tooth covered at all times. If the tooth is left open it can be damaged further and the emergency dentist may not be able to refill it which can result in an emergency tooth extraction. Tooth extractions can be among the most stressful dental emergencies. The emergency dentist will make sure you don’t feel any pain, just some light pressure. They will numb your mouth and make a few incisions to loosen the tooth. Then, using dental pliers, the emergency dentist will use a rocking motion to loosen the tooth until it pops out. Sometimes the tooth has to be broken up into pieces if this initial method doesn’t work. Once the tooth is extracted, you will receive instructions for aftercare at home. These instructions must be followed to keep the extraction site clean and free from infection. This will assure that healing goes quickly and smoothly. If you’ve been in an accident and have multiple injuries, you’ll need to find out if you need an emergency room doctor or a dentist. If you’ve endured any head trauma, this is your first priority and you need to go to the emergency room. Emergency room doctors are not equipped to save your teeth so if no head trauma has been endured, schedule your emergency dentist appointment. Have any questions or want more information about the network? Please contact us.